Many older women in Africa continue to be victims of gender-based violence despite the gains made by the international community to protect the rights of women and improve their socioeconomic and political conditions, says Sam Slewion, a social justice activist and Representative for Liberia for the International Network for the Prevention of Elder Abuse(INPEA). Mr. Slewion told the gathering, comprising mostly women, that while women rights activists and civil society organizations are basking in the euphoria of celebrating the gains made to improve the lives of women within the context of social, economic, political and education mobility, it is disheartening that there still exists practice of witchcraft accusations in many African countries that are oppressive and dehumanizing to women, especially older women and children. Mr. Slewion, who is also Associate Professor and Chairman of the Social Work Department of the United Methodist University in Liberia, said while the international community can credit itself for adopting some conventions and proclamations for the protection of women, the world continues to witness millions of women, including older women, being subjected to gender-based violence, including witchcraft accusations against older women who are sometimes murdered or ostracized by their communities once accused of witchcraft. He said in some African countries, including Ghana and Nigeria, over 1000 older women and children alleged to be involved with witchcraft practices are forced to live in “witch camps” designated by their local governments to isolate them from their communities. “The conditions of the so called Witch Camps are inhumane and lack access to basic facilities and education for the children,” Mr. Slewion noted. He said the victims of this continued witchcraft accusations seem to share similar profile despite which country they reside. “They are usually older women, poor (low economic status), widowed, childless, illiterate, do not have any male protector-son, husband, brother, and disabled and they live in rural communities,” he intimated. 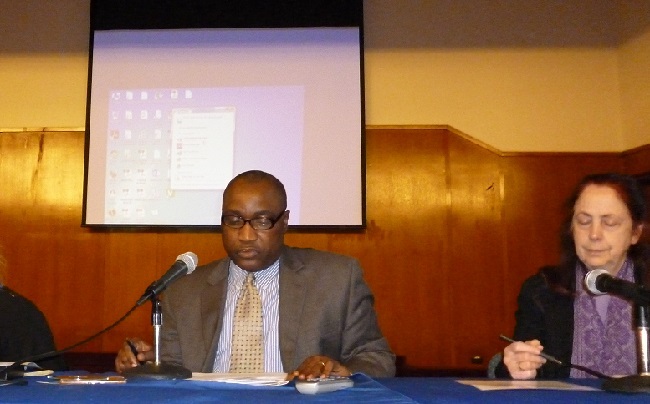 Mr. Slewion, who is also consultant to the Coalition of Caregivers and Advocates for the Elderly in Liberia (COCAEL), then described the drivers of this continued use of violence against older women under the disguised of witchcraft accusations as the lack of a specific UN Convention to protect older people, the use of images in films and documentaries portraying older women as witchcrafts, most especially by African film producers and the lack of political will and rule of law in many African countries to hold accountable those perpetrating such violence which is orchestrated mainly by men. He, therefore, called on the United Nations to listen to the “global voices” being led by the Global Alliance for the Rights of Older People (GAROP), urging that body to adopt a UN Convention for the protection of older people globally. “We have a moral responsibility to ensure that all women live their lives without fear and this can be manifested through the adoption of a specific UN Convention that protects older people, especially older women no matter which continent they live,” Mr. Slewion passionately appeal to the international body.